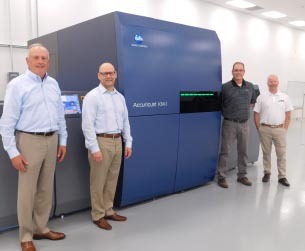 Konica Minolta’s AccurioJet KM-1 UV Inkjet Press Exceeds Expectations for General Marketing Solutions, Inc.
Ramsey, N.J. – Konica Minolta Business Solutions U.S.A., Inc. (Konica Minolta) is pleased to offer customers the latest technology to help their businesses move forward. For General Marketing Solutions (GMS), an integrated marketing services company, it was time to switch to inkjet technology to better support and deliver its commercial printing jobs. “At GMS, our focus is to redefine how print is bought. We bring to the table a solutions-oriented process that starts each conversation with strategy and return on investment. We wanted to invest in technology that would offer a full complement of printing capabilities to support this philosophy and fulfill our clients’ critical color needs and timeline requirements,” said Kurt Gonyea, President and CEO of GMS. GMS’s significant switch to inkjet technology has paid off: The company found the AccurioJet KM-1 delivers outstanding stability in color and provides a wider and deeper color gamut. AccurioJet KM-1’s color accuracy and quality were above and beyond GMS’s expectations. Mone and his team were also impressed with the AccurioJet KM-1’s ultraviolet (UV) ink; it produces extremely high-quality prints and does not require any heat drying. The UV ink enables GMS to print on a variety of materials without the need for any pre-treatment. The inkjet press’s 23x29” sheet size and many other capabilities have allowed GMS to print large quantities with more productive uptime. The AccurioJet KM-1 automatically detects and corrects image flaws with internal inline Konica Minolta sensing technology, improving the stability and overall quality of print jobs. GMS will be able to reduce downtime with a number of components that can be replaced by customers in the field, such as the inkjet heads. The AccurioJet KM-1 UV Inkjet Press has established itself as a leader across all segments of the North American Marketplace, supported by the record number of installations in 2018. L-R: Bill Troxil, SVP Strategic Business Development, Konica Minolta Business Solutions; Kurt Gonyea, President/CEO, GMS; Troy Mone, Manufacturing Manager, GMS; James Trowbridge, Director of Manufacturing, GMS.